to form a powerful, high-performance SSD server. 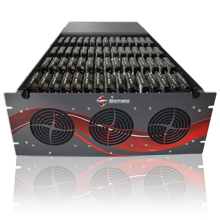 Our Storinator Storage Servers solve storage issues by letting you store huge amounts of data while still being extremely affordable. 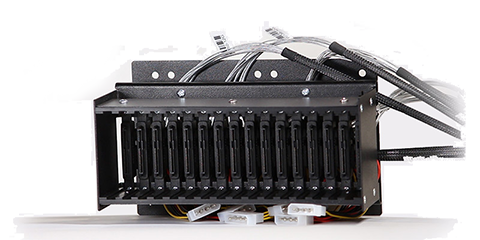 With the installation of an SSD bank, you can utilize fast random access and storage all within one single chassis. The combination of SSD and mechanical storage gives extremely fast random access to active data. Once you are finished working from your SSD, you can move your data to the mechanical hard drives for longer term storage. Doing this within a single chassis allows for extremely fast transfers. 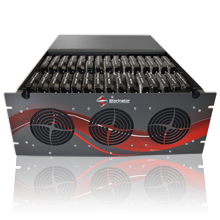 What are the benefits of adding an SSD bank to your Storinator? 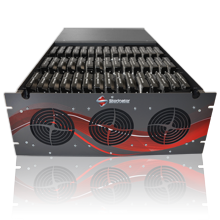 Affordable: Our Storinator Storage Servers solve storage issues by letting you store huge amounts of data while still being extremely affordable. With the installation of an SSD bank, you can utilize fast random access and storage all within one single chassis. Faster random access to data: Having an SSD bank installed in your Storinator will give you faster access to your data while you're working. This is until you are finished with it, in which case it can then be migrated to the hard drives for longer-term storage. Accelerate your I0 performance: With different combinations of SSD/hard drive setups - based on your specific workload an SSD bank can accelerate your IO performance dramatically. 0ptions available for every requirement: There are 16 and 32 bay options that are available for most Storinator models. Flexibility: Building out options for massive hybrid storage or an all SSD storage system, both configured for your use case. Adding 1 SSD bank (16 SSD slots) replaces 8 HDDs (approx. half a row). Adding 2 SSD banks (32 SSD slots) replaces 15 HDDs (an entire row). Be sure to talk to our team to find the best configuration for you - based on your workload. The combination of massive SSD and mechanical storage gives you the option for tiering or caching in order to get extremely fast random access to active data. Once you are finished, the data can be migrated to the mechanical hard drives for longer term storage. Doing this within a single chassis allows for extremely fast transfers between tiers. Caching and tiering can be handled on an OS, NAS, or cluster layer, or even at the application level. Hybrid storage lets you accelerate your IO performance with different combinations of SSD/hard drive setups, based on your specific workload.